A newly-built, 5,700 square foot home in Cedar Hill has a lot to offer on top of its stunning location. “Please come in,” said Gary Karnavas, the homeowner who also worked as the general contractor for his home’s build-out. He said the view is his favorite thing about their new home, which he and his wife plan to live in for the remainder of their retirement. “This west wall right here has actually got 300 square feet of windows,” Gary said, detailing how they maximized the great viewing opportunities. But it’s what you can’t see, that brings Gary the most comfort during severe weather—a topic Gary knows a lot about. “I have a degree in meteorology, so, funny enough I get real obsessed with it,” Gary said. 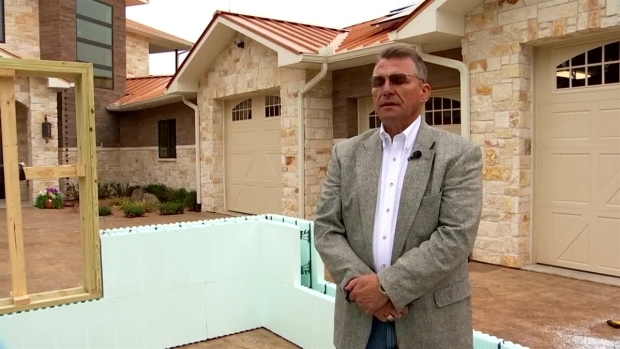 To protect his family from dangerous wind, flying debris, and even a tornado, he built his home with I.C.F., which stands for Insulated Concrete Forms. Basically, the walls of his home have a six inch core of concrete. A team from NUDURA Integrated Building Technology, which is the product Gary chose to use to build his home, set up a demonstration to explain what’s inside his walls. In its most simple explanation, the hollow forms are polystyrene blocks with spacers inside. They snap into place and stay there permanently to serve as insulation. Rebar lines the inside of the forms and also connect them to the foundation. Then the middle of the form is filled with concrete. The result is a building that’s stronger than a wood-built home. “It’s about nine-times stronger than conventional construction,” said Cameron Ware with NUDURA. Cameron Ware with NUDURA Integrated Building Technology talks about the 70-plus schools in North Texas that they have helped build using Insulated Concrete Forms to make schools safer. He said they sent their concrete forms to Texas Tech to get tested for their strength against storms. “This product can be built pretty easily to 250 mile per hour wind rating,” Cameron said. That means that the walls of Gary’s home can withstand an EF5 tornado. Gary said his home’s windows, however, would need to be replaced. 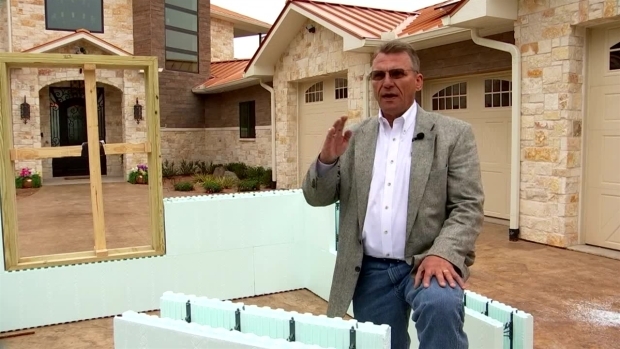 If safety-rated concrete walls aren’t enough, Gary also had a tornado shelter built inside his home, which is also constructed out of Insulated Concrete Forms. “Now this is purely cosmetic,” Gary said as he wheeled a barn-door style panel to reveal the tornado shelter that doubles as a pantry near his kitchen. “And you are then encased in concrete, inside of a house that’s concrete,” Gary said, while showing the steal door that locks shut. Gary has only been close to needing a shelter one time: It was 61 years ago to the day of this interview. “I saw the Dallas tornado in South Dallas and that’s like my most vivid memory of seeing a tornado was that,” Gary said. Now, he said he has no worries because of this reinforced space for his growing family. And they’ll all have an added sense of protection thanks to what’s hidden within their normal-looking walls. “It gives me the security to know that we were able to achieve a very safe environment,” Gary said. So no matter what the wind blows their way, their concrete home is better-built to sustain it. Cameron Ware with NUDURA Integrated Building Technology explains the cost estimate for building a home with Insulated Concrete Forms. Cameron, with NUDURA, said the cost of building with Insulated Concrete Forms really varies on the home, but on average it can add an additional 5-10 percent on your overall build price. The additional benefits include improved energy efficiency, fire safety, and sound proofing. Gary said he’s already impressed with his home’s energy efficiency. For his 5,700 square-foot home, his most expensive electric bill has been $200.